A lot goes into the purchase of a new black & white or color copier for your business. It probably seems overwhelming as you search through all the different models online. 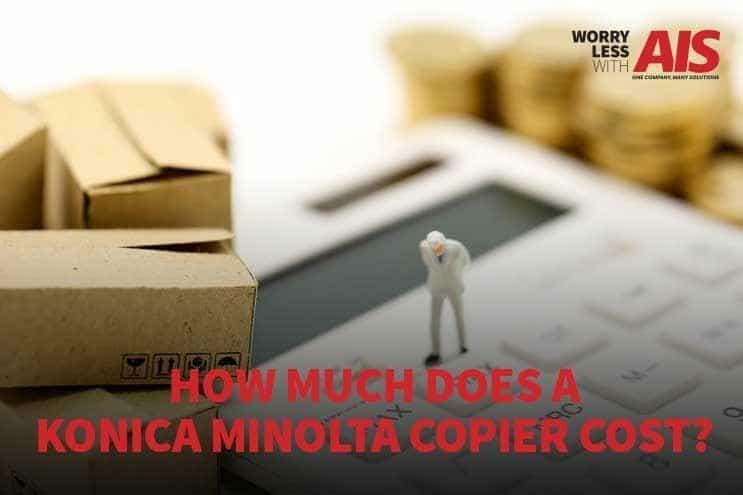 The costs associated with Konica Minolta Copiers range in price, depending on your specific business needs and goals. While some Konica Minolta Black & White MFPs cost around $2,000.00, other Konica Minolta Bizhub PRO Copiers can cost over $55,000. If you’ve ever bought a car before, think about your specific requirements. Did you have a price range or a budget you wanted to stay within? Were you curious about specific features or add-ons? How did you decide between a new and a used vehicle? The purchasing decisions you made for your new car is similar to purchasing a new copier. Purchasing a Konica Minolta copier for your business requires some of the same research skills and planning. Also, as a heads up, when you see the abbreviation, “MFP” or the word, “multi-function printer,” think “copier.” A multi-function printer to do just about everything you need, such as scanning, copying, printing, and faxing. As you probably know, there’s an overwhelming amount of Konica Minolta copiers, printers, and multifunction printers on the market. Narrowing down the best options for your business is challenging. We’ve done the hard work for you! We’ve researched Konica Minolta copiers and categorized them by price, color capability, print volume, and print speed. If you’re not sure where to find the best copier companies near you, we’re here to help! Read our article, How to Find The Best Copier Companies Near Me. Konica Minolta MFPs range in price and features. We’re first assessing one of their most basic product lines, their Black & White multi function printers. Most Konica Minolta B&W MFPs range from about $2,000.00 to $12,000.00. The ppm (pages per minute) varies from 16–65 ppm. Even though these machines only print and copy in B&W, they certainly have the capacity for more substantial production printing needs. If your company needs black & white and color printing, Konica Minolta also has a line of copiers for you. These multifunction printers and copiers range in price starting around $3,000 and can get up to $14,000. These MFPs also range in ppm, from 22 ppm to 65 ppm. Depending on your office needs, any one of these office copiers could be an excellent fit for your business and employees. These types of MFPs are for businesses with heavy-duty printing needs, or with consistently large printing demands. The Konica Minolta Bizhub PRO Copiers range in price between $40,000–55,000+, also varying in 55 ppm–95 ppm. These printers are big and take up a lot of space in your office. You’ll need to make sure you have the room to accommodate. Over the years, Konica Minolta developed better practices for technology management, helping identify and resolve common and advanced business problems. Konica Minolta made it a point to learn the challenges your business faces each day that contributes to productivity issues. Information Security. How many stories regarding data breaches and cyber-attacks do you hear nowadays? Technology is advancing, and cyber-criminals are smarter than you think. It’s becoming easier for anyone to access certain areas of your business. Konica Minolta provides your office equipment with security services and solutions you need. Learn about preventative plans that keep your networks, servers, and business machines a step ahead of cyber-attacks and online scams. Herzing University published a great article on network security you might find interesting. Please follow the link, here to read, What is Network Security and Why is it Important? Mobility Management. Our smartphones and mobile devices continue to change and transform business productivity and the way we work. It’s pretty amazing to learn everything our smartphones can do as far as incorporating them into our business technology needs. Konica Minolta’s mobility management enhances productivity. Learn about sharing and collaborating on projects, extending business processes, optimizing and automating workflows, and printing remotely. Automated Workflow. With the flood of data and paperwork that businesses manage and utilize every day, it’s easy to get overwhelmed. Konica Minolta’s experience in delivering workflow management solutions provides the user with workflow automation software. Automated workflow gives users the ability to control, handle, share, and store important business documents all in one place. Print Management Software and Solutions. Ever wonder how much your office spends on printing and copying costs each year? It’s important to control the costs of the number of pages you and your employees print. It’s also critical you learn the advanced security features of your machine. Learning about security ensures your sensitive documents don’t end up in the wrong hands. Konica Minolta’s print management solutions also reduce document waste with simple integration to your current networks. Business Process Automation. Business process automation gives you control over your operations. This helps you monitor, evaluate, and maintain tasks and processes in real time. With rules-based parameters established, it’s easy to manage activities and enable alerts, keeping your operations on track. With the continuous review of your workflow activity, business process automation allows optimization workflow, providing maximum efficiency. Graphic Communications. Does your business rely heavily on graphic communications? There’s a lot of unique business solutions Konica Minolta can provide you. High-quality imaging, consistent color, benchmark service levels, and emerging products, make your printing and copying experience more efficient. The “Accurio” line of print devices reflects the advanced, automated, and precise nature of graphic communications business solutions. It's a great place to begin your differentiation in a very competitive market. To learn more about copier costs, read our article, How Much Does a Copier Cost? A Quick Overview. Visit our Office Copy Machine Ultimate Resource Page for additional info on just about anything related to office copiers. AIS is your resource when it comes to business technology solutions and products. If you’d like to learn more about our services, reach out to one of our business technology consultants, here. Want to know why we represent different copier lines and products? Our goal is to make your office purchasing decisions easy, by exploring common brands on the market. We’re here to give you peace of mind to help you win more business.